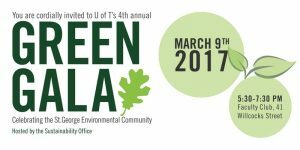 Join us as we celebrate the collective hard work and accomplishments of the staff., students and faculty who make up the enviro community on St. George campus. There will be lots of opportunity for conversation and time to enjoy complimentary food and refreshments. Yes. There is a limit on the number of attendees, so please be sure to RSVP here by March 2nd. No, please don’t! Save paper – use your phone, or provide your name at the welcome table! Will there be vegetarian or vegan options? No, but tea, coffee and other non-alcoholic refreshments will be! What are the Green Ribbon Awards? Who can I contact with any further event questions?